Content elements allow your cards to hold information that a paper card never could. There are 20 different types of elements and even more ways to use them. 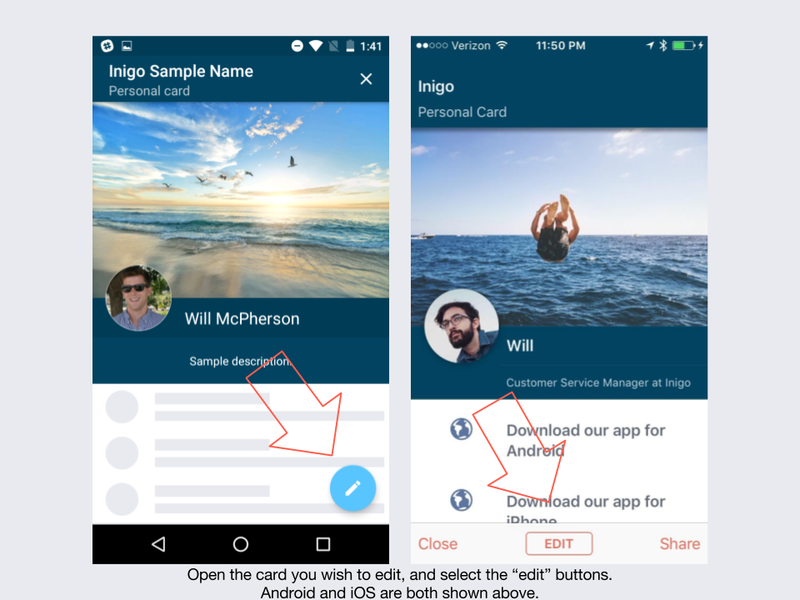 This guide will teach you how to add new elements, edit elements, and select which elements to use on your card. 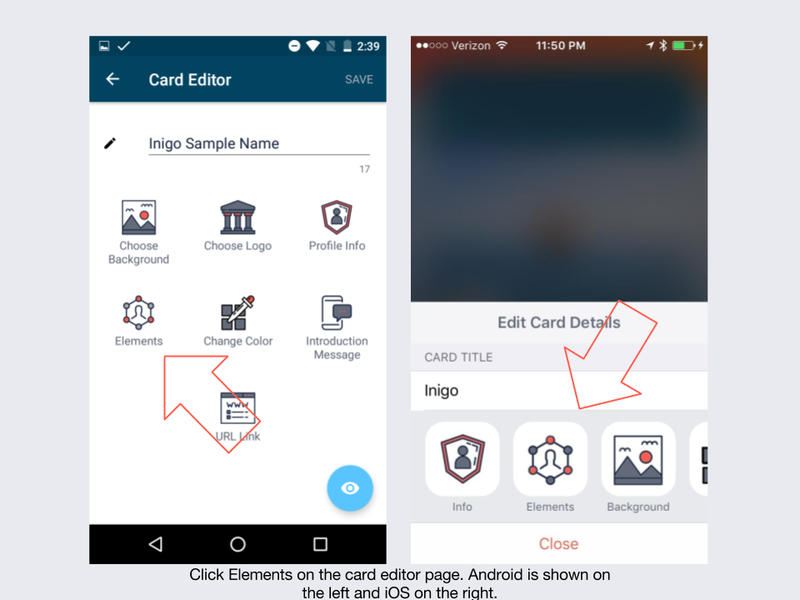 To add content elements, please open an existing card on your Inigo app, or create a new card as shown here. Click the edit button on the bottom of the card to go to the "Card Editor" page. Choose "elements" to access the elements page. 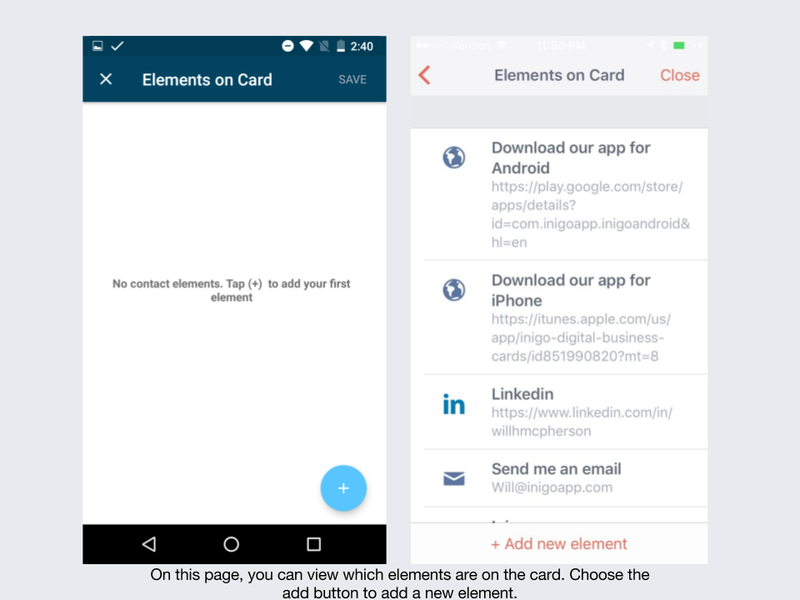 This page will show you elements that are currently on your card. To add new elements, click the + button on the bottom right-hand corner to add new elements. 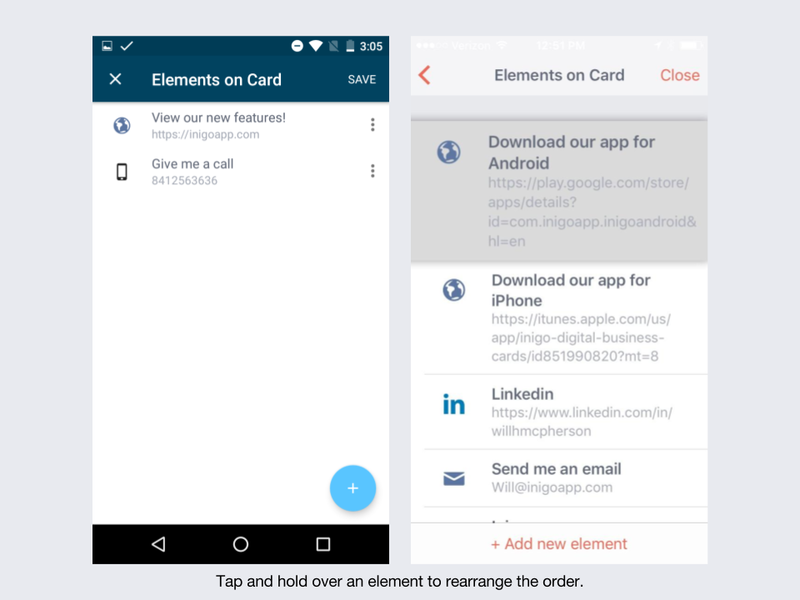 This page will show you elements that are currently on your card at the top of the page. Beneath these elements, you will see options to add new elements by clicking on either the element icon or the text field. Before we add a new element, you should look at the choices that exist on this page. You can add a phone number, website, social media accounts, email, Youtube videos, and even more! 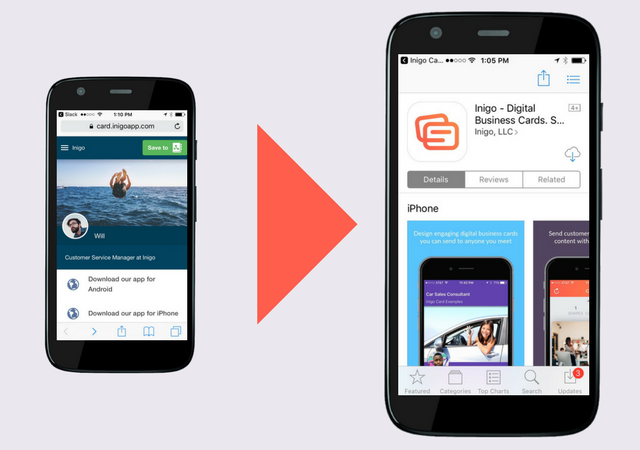 Some of these elements can serve more than one purpose: You can add a link for an application in the app store by adding it as a website. You can also add text by clicking "free text." Click on a content element type to add it to your card. For this example, let's choose a website. Click on an element to add it to your card. For this example, let's choose a website. After you click the element, you will be taken to a page with two text fields. The first line of text is the text that will appear to label your element. You can choose something that will tell contacts where the link will take them. The second line of text is for the URL or source information, such as a twitter handle. Make sure that you input the URL correctly, and test it after you are done. After you input this text field, click save in the top right-hand corner for Android. If you are using the iPhone app, the element will save automatically when you click close. This will take you back to the "Card Editor" page. Click the view button in the bottom right-hand corner in order to see your new element. To edit an existing element, open a card and click the + button on the bottom right-hand corner. Choose "elements" to see all of the elements that are currently on this card. You can click on the element to edit the text that appears or the URL depending on which type of element it is. 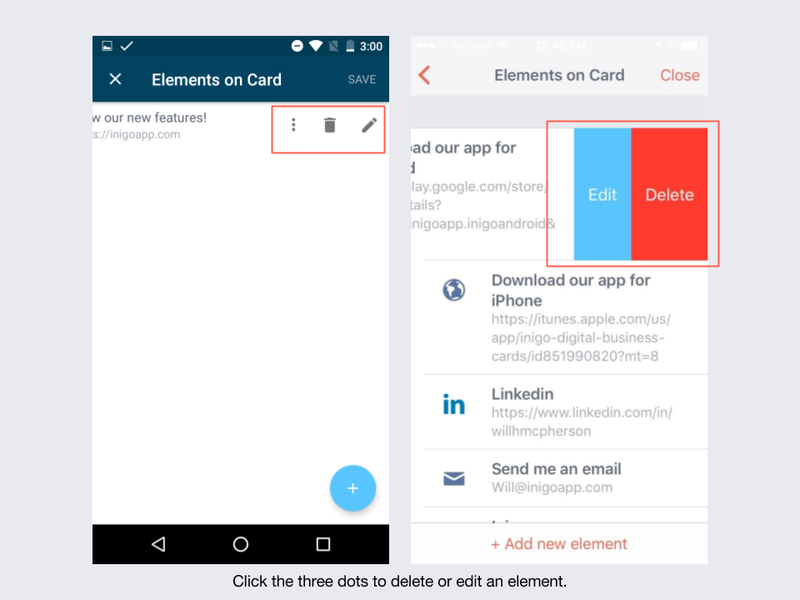 To delete an element, please click on the three dots to the right of the element for Android users. For iPhone users, slide the element to the left. Choose "elements" on the Card Editor page to view all of the elements currently on your card. Tap and hold on the element that you would like to move. Move the selected element up or down to rearrange the order that they appear in. For more ideas about exciting ways to use elements view our collection of guides based on profession.